Surely this can’t be happening to me. I love what I do. Yet the signs were so insidious and I thought, as most nurses do, that I could do it all. In the beginning, I stopped doing yoga, then meditation and then eating properly. My self-care went down the drain. I was irritable with my children and frustrated with myself. I woke up at night thinking about work. It got to the point where I felt like I just needed to run away. I tried to take a day off here and there but it did not work. I needed a good week to recharge my batteries and get back into my self-care routine otherwise I was afraid I would get sick and if something happened to me, who would take care of things. Nursing is one of the most stressful professions in the world. We nurses are empaths and take on our patients’ issues. We feel their physical, mental and emotional pain. 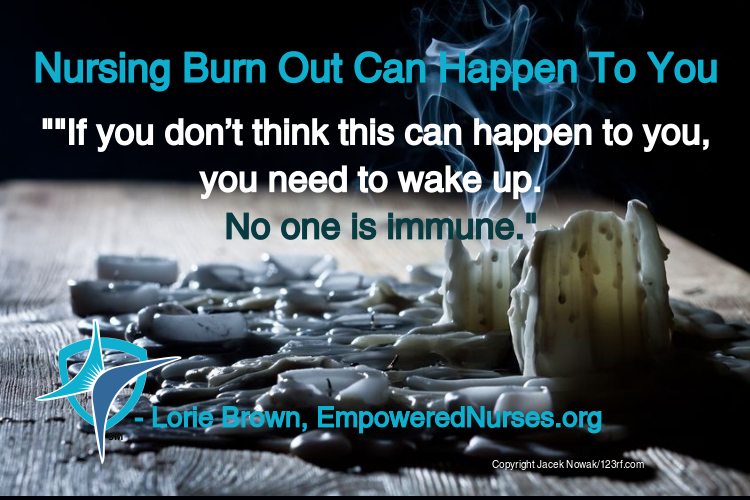 Burn out is caused because we deal with our patients’ life-threatening diagnoses, stresses and even death. Before we have a chance to process those emotions, we are busy taking care of other patients. Nurses are especially prone to mental exhaustion. feeling like you’re going through the motions. If you are exhibiting any of these symptoms, the first step is to recognize that these are symptoms of burnout. As nurses, we tend to “power through” everything rather than stopping, recognizing what’s going on and seeking help. If you are experiencing burnout, go see your Employee Assistance Program. It’s free and they offer counseling, stress management and self-care support. If you’re worried about your job, going to the Employee Assistance Program, which is completely confidential, will help you with that as well. It’s also helpful to keep your personal and professional lives separate, avoiding dwelling on work issues at home. For me, I noticed that I would wake up in the middle of the night thinking about work. When this happens, it’s important to take time for self-care, eat a well-balanced diet, exercise and get adequate rest. Try focusing on hobbies and relaxation techniques plus meditation and journaling. All of these will help with burn out. If you don’t think this can happen to you, you need to wake up. No one is immune. But, before it gets too bad, it is better to deal with the issues than to have it evolve into something else. Now that I am back, I feel rejuvenated. The work is still there but I feel better about myself and my passion and my commitment to help nurses. What are you doing to take care of yourself? Share with us in the comments below.